This letter is to recommend Medical Billing Resources as an outstanding choice for a third party medical billing and coding company. We have used Medical Billing Resources for both the coding and billing of our 17-provider cardiology practice. They have provided us with outstanding service, billing, and accounts receivable management. We also believe they were able to offset some of the third party reimbursement decreases through effective coding of our procedures. Their service to our patients over the years has been second to none. Their staff includes Certified Professional Coders, Certified Cardiology Coders, and Certified General Surgery Coders, and their commitment to the continuing education of their staff gave us comfort in their ability to process our claims appropriately. We would recommend Medical Billing Resources to any practice, but especially to the large practice that needs a high level of professionalism and understanding of corporate practice culture. The staff at Medical Billing Resources is very hard working and will pursue every dollar you are owed. It is my pleasure to provide a recommendation regarding Medical Billing Resources (MBR). We have been a client of this company for over 15 years. MBR took over our in-house billing and immediately improved our billing output and revenue. Within three months, MBR had decreased our receivables by over 20% and in adddition, they were able to capture unbilled revenue because of missing codes, which further increased our revenue by over 15% the first year. This is a proactive company, frequently notifying us of Medicare rule changes, providing us with billing updates and informational e-mails to improve our revenues and customer service. Because of their emphasis on continuing education, individual staff were highly knowledgeable. We found that our practice, by staying "ahead of the curve", became a resource for other cardiology practices when dealing with difficult billing problems. In addition to being knowledgable, MBR billers and coders were articulate, courteous and resourceful when dealing directly with our patients. 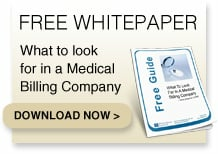 I am pleased to recommend Medical Billing Resources to you highly and without reservation. I began working w/ MBR 2 years ago, very frustrated after my first 5 yrs experience in private practice and bitter about my experience w/a billing company that had come highly recommended to me by colleagues I trusted. From the start MBR has been open and willing to teach me (and to learn w/ me) about the use of E&M coding in Psychiatry and the use of extender/modifier codes in order to be fairly paid for the extra work done in my time-intensive geriatric practice. As a simple example, utilizing the appropriate codes for initial evaluations (not 90801!) in the complex geriatric and neurologically-impaired patients I see allows me to be fairly paid for the 90-minute and sometimes 2 hour long evaluations I do -- rather than leaving thousands of dollars on the table. I have actually made a dent in my bank loan, which had been increasing, not decreasing, over the previous years, as I have seen my revenues increase as a direct result of intelligent billing. In addition, Karyn and her staff are a pleasure to deal with. Pls contact me via email for further info. I highly recommend this company. Our facility has been a client of Medical Billing Resources for a number of years. When MBR took over from our in-house billing department years ago, the improvement in our receivables was immediate. Karyn and her staff keep current with the ongoing changes in managed care and government regulations regarding billing, and that expertise is invaluable. MBR's competent staff has remained unfailingly professional, cordial, and pro-active in dealing with our facility, and has made a positive difference in our bottom line. 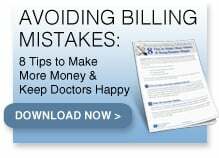 I have been a client of Medical Billing Resources for five and a half years. I feel incredibly fortunate to have such an outstanding group to handle the billing for my cardiology practice. They are extremely knowledgable and on occasion when I have an unanswered question, they have gone out of their way to find resources or consultants to help solve my problems. I have no doubt that they work hard to collect on the difficult claims as if they were collecting for their own business. MBR has in-house expertise in cardiology coding and billing, and therefore has deservingly earned other area cardiology practices as clients through an excellent reputation. They are endlessly patient answering my questions and going over details with me no matter how often I call. I hope to continue my relationship with Medical Billing Resources for the lifetime of my practice. I would like you to know how much I appreciate your efforts on my behalf when I was in private practice. My collections doubled when you took over the billing. Your cooperation and expertise are greatly appreciated. I have known Karyn Shatzman for several years. She and her company are the most competent billing service that I have ever dealt with. I have worked over the years thru the hospitals, private physicians' offices and for the Chief of Surgery. No one matches to the abilities of Karyn and Medical Billing Resources. It is very difficult to find medical billers that truly know the best way to code surgeries and procedures. However, Medial Billing Resources are at the top of my list. When Karyn took over our billing several years ago, we were not doing as well financially as we could have. After Medical Billing Resources took over our billing, our profits tripled. She has great knowledge of her job as do the people who work for her. They continually go above and beyond. I have referred many medical practices to them and the feedback has been tremendous. All the offices that I referred to them have had their revenue increased and they are just as satisfied with the work that Karyn and Medical Billing Resources does as I am .